I used to play a computer game called Mutual Assured Destruction. Set during the Cold War, which was still going on at the time, the player determined how, when, and how many intercontinental missiles would be sent to a wide list of targets, before all of the cities in the player’s countries were wiped out by the computer’s decisions for the other side. Winning the game required the player to overwhelm the opposition with a flood of missiles to each target. The defenses couldn’t handle all of the multiple incoming bombs, and the other side was quickly eliminated. 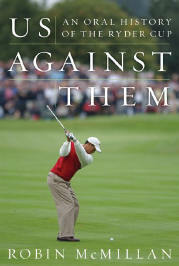 I was reminded of this game as I read Robin McMillan’s Us Against Them, (HarperCollins; $25.95). This fascinating history of the Ryder Cup matches frequently discussed the strategies used by the captains on both sides in forming up their teams. McMillan went through the archives and also tracked down many of the participants for their own take on their experience. Once again I’m struck by how golfers can remember yardage, club selection, and results from rounds that took place decades ago. McMillan does a nice job rehashing the story, familiar to avid golfers, of how the Cup came to be, how the eventual lopsided nature of the contests slowly diminished fan and player interest in the competition, and how Jack Nicklaus and others found a way to revive the event to the high stakes, extremely popular fall contest it is today. The appendix at the back of the book lists all of the results from each match, for the agate-type readers among us. McMillan also recounts the gamesmanship that some players used to great effect. For example, Seve Ballesteros was a great match player not only because of his scrambling ability, but also because he was able to make his competition think more about him than their own game. Paul Azinger and other American golfers were also able to unnerve their opponents, and not just with their swing technique. Everyone with match play experience knows not to assume they have a hole won when their opponent is in trouble, but getting ahead of oneself emotionally remains one of the hardest tendencies to fight against. As several of these interviews show, the professionals are just as prone to it as any of us duffers. Unlike normal golf, Ryder Cup competition also forces its participants to remember that they are in a team-based game. That, of course, is one of the major appeals of the Cup, both to the players and the fans. The players frequently discuss this facet of the story, and its one of the common threads that bound all of the participants. For me, the really intriguing part of the story is how the captains figured out who should play with whom during the foursomes and four-ball matches, as well as the order of play during the last day’s singles event. Some captains were up to the task. Equally clearly, some were not. Based on these interviews, the winning strategies are pretty simple. In foursomes, the alternate shot format, make sure each team has one player that can keep the ball in play, and another player capable of streaks of erratic brilliance. In four-balls, try to match up players with similar temperaments and ball-striking abilities. For singles matches, however, the best strategy takes a page from Mutual Assured Destruction. Always lead off with your strongest players, and overwhelm the other side before the final match. Both Europe and the United States have certainly won without using this tactic, but they’ve also unwittingly increased their odds of losing when they didn’t. The book’s publication was timed to coincide with this year’s contest. Unfortunately for the Americans, the Europeans whacked them again. However, I can’t help but think that if this year’s team had read this book before the event and “listened” to the players who preceded them, the outcome might have been different. At least they’ll have McMillan’s collection of advice handy for the next time.